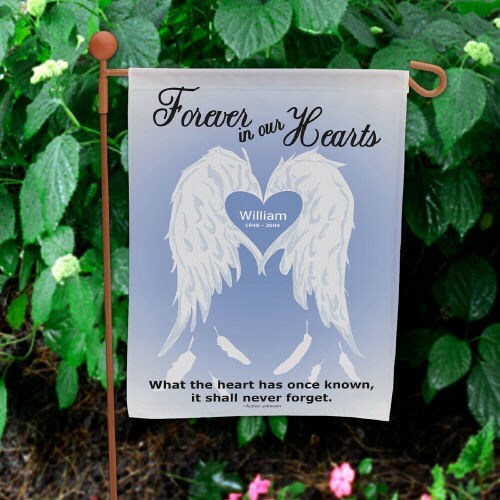 Personalized Forever Angel Wings Memorial Garden Flag. The perfect way to express you love for a lost love one is to have a memorial flag to remember for years to come. Remember a loved one that has passed and honor them by displaying this beautiful Memorial Flag in your yard. Memorial Flag is a lovely way to express your remembrance of a loved one when placed in the front of your home or at their final resting place. A memorial flag is the perfect way to give a flag to any family or friend to remember a love one. The metal pole is the standard for the Garden Flag for outside garden or yards. A Metal Pole is optional. Is perfect to have your garden flag on the yard or garden or any where outside. 40.5” high and 14.5” wide. The base of the pole, which sits in the ground, is 6” high. When securely set into the ground the flag pole will sit 34.5” high. It holds a 12” x 18” flag.